The Bulldogs will face their first "real" opposition tonight as they open up their five-game Exhibition schedule by hosting the Cowichan Valley Capitals at the Dog Pound. The Capitals had their first "live fire" exercise last night as they played the Victoria Grizzlies to a 4-4 draw at the Juan De Fuca Arena. 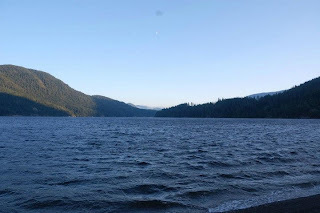 I won't be making the game tonight as I'm squeezing in one last family outing heading down the Alberni Inlet to the McTush Creek Campground for a pig roast and the "die hard" derby tomorrow. Accept my apologies for not being able to keep you updated real time tonight, but it's a very long season being away from the family so I want to take advantage of the chances when I get them. As we broadcast every single regular season and playoff game there are no nights off once the puck really drops! McTush...worth a trip if you haven't been, a short drive from town! I will keep you updated on tomorrow's game from the Frank Crane Arena at 7:00pm! Until then, wish me good fishing, I haven't been out to get a Salmon this year!